The Galileo thermometer, manufactured in glass, is a decorative instrument for measuring temperature. Based on Galileo Galilei´s buoyancy principle, which says that the density of a liquid changes proportionally to its temperature. 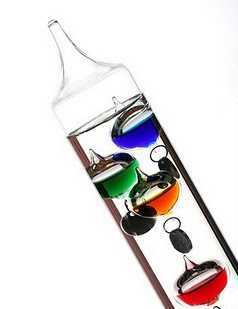 This thermometer is comprised of a glass cylinder with glass balls of different colors immersed in an inert liquid. Each ball is associated with a temperature which is engraved in a metal plate. All materials are safe. The thermometer works as follows: with the temperature changes the multicolored glass balls rise and fall. The temperature is that of the lowest ascending ball. Application: home, schools, meeting rooms, offices, restaurants, etc..